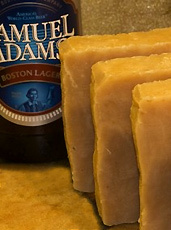 Presenting Sam Adams Beer Soap, a new way to spend some quality time with your favorite hoppy beverage, now available. Now, you may be thinking: hey, small-batch artisanal soap made from Samuel Adams Boston Lager is a waste of perfectly good beer. And we understand. But you’re going to have to get past that. And when you think about it, it’s not even that crazy. The natural amino acids and B vitamins found in beer are known to be good for your hair (as you can attest from freshman year, when you shampooed exclusively with Killian’s Red), so the same can be applied to caring for your skin. Next up: vodka body wash.